There are more trucks than ever on the highway. The internet economy (call it the Amazon effect) has made over-the-road shipping more popular than ever. So it’s not just your imagination. You are indeed encountering a higher number of trucks. This is the case all throughout the nation, but is felt keenly on Michigan and Ohio roadways, because of the number of small and large manufacturers housed in our state. So, the trucks are here to stay. Make sure everything you control in your car is as safe as possible. Are you completely sober? Are you and all of your passengers belted in? All children must be belted, but please also encourage all adults in your back seat to buckle up, even though they are not required to do so, by law. Is your car in good working order with excellent windshield wipers, and properly working defrosters? Pass on the left, never on the right. Trucks are expecting to be passed, as they often have a lower posted speed limit. But they are expecting to be passed on the left. Trucks have limited ability to see and a larger blind spot than cars, so place your left turn indicator on when you are getting ready to pass. 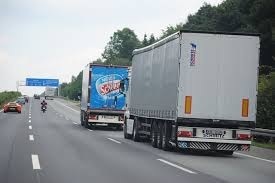 Pull two truck lengths in front of the truck, place your right signal on and then move in front of the truck. Do not pull in front of a truck if you think you might have to brake quickly. Trucks (and other large vehicles like buses) take muck longer to brake and come to a complete stop than smaller vehicles. If you do not leave sufficient room between you and the truck behind you and the truck driver cannot brake in time to avoid a collision, he will either have to swerve or hit you. Don’t take a chance. Be aware of a truck’s blind spots. The general rule is if you can’t see the truck driver in the truck’s side mirror, the driver can’t see you. So when you find yourself in a blind spot, get moving, either slowing down or speeding up to get out of the blind spot. Don’t hang out to the side of the truck; just pass on the left side quickly and safely. Allow for wide right turns. Trucks can’t take tight right turns. So if a truck is to the left of you or to the front of you and they have on their right turn indicator, stay back, allowing them to move to the left in order to make the full right turn. Again, avoid hanging on the right side of trucks as they prepare to make a right turn. Keep your full attention on driving. This rule applies all the time, but can be life-threatening on highway conditions with trucks. Don’t text, don’t fiddle with the music (radio or Iphone), don’t eat or apply make-up. Driving takes all of our attention and more. Even complicated discussions with passengers can be distracting. Trucks and their drivers are an important part of our economy. We have to be aware of the hazards that trucks bring to the roads in order to stay safe.